Irvine, Calif., April 1, 2013 — California sagebrush in the southern part of the state will adjust better to climate change than sagebrush populations in the north, according to UC Irvine researchers in the Department of Ecology & Evolutionary Biology affiliated with the Center for Environmental Biology. 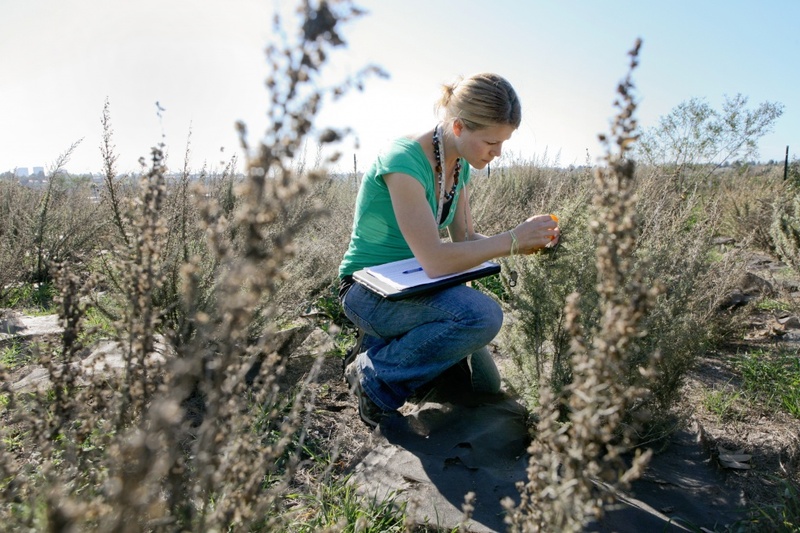 The results of their study, which appears online in Global Change Biology, will assist land management and policy decisions concerning coastal sage scrub restoration. California sagebrush (Artemisia californica), also known as “cowboy cologne,” is the fragrant gray-green shrub that once filled area ranch land. It’s found on coastal hillsides for more than 400 miles along California’s Pacific coast. Only about 10 percent of its original habitat remains – the rest having been converted to human use – and is home to a number of endangered species, including the California gnatcatcher, which depend on plants like sagebrush. In their study, Jessica Pratt and Kailen Mooney transplanted sagebrush from sites up and down the California coast to a test garden near UC Irvine to see which shrubs were best able to withstand particular environmental challenges. They measured the differences in plant traits and responses to experimentally altered precipitation. The researchers found that populations from southern sites, with historically variable rainfall amounts, adjusted with greater ease to altered precipitation than did populations from the historically invariant north. Accordingly, they asserted, reaction to climate change will differ across this species’s range, with southern populations adapting more readily to future conditions. “For instance, sagebrush from San Diego stretches, where precipitation varies substantially from year to year, were better able to respond to changes in precipitation than those from the San Francisco area,” said Mooney, an assistant professor of ecology & evolutionary biology. He and Pratt also analyzed long-term climate data from along the California coast and discovered that year-to-year variability in rainfall has been increasing. Taken together, these findings suggest that it might be prudent to plant Southern California sagebrush on Northern California hillsides to compensate for this heightened fluctuation in precipitation. Taxpayers and private donors currently spend millions trying to properly manage the remnants of coastal sage scrub and other diverse habitats that remain on public and private land. Pratt and Mooney hope to determine which strategies are most effective for the least cost. The study received support from the Newkirk Center for Science & Society, the UC Irvine Graduate Division (through a 2011-12 Public Impact Fellowship), the Orange County Association of Environmental Professionals, the Newport Bay Conservancy and the Lake Forest Garden Club, as well as grants from the National Science Foundation and the Environmental Protection Agency. The Center for Environmental Biology at UC Irvine links academic research and education with ecosystem management, stewardship of natural resources and sustainability efforts throughout Southern California.